Lots of potential there. As for me, and green is my least favorite color, I would vote for sending the cabinets to the dump also. New cabinets for the new woodshop sounds better. wow, lots of potential here. It will be interesting to follow the transformation. Agree, the green color has to go 🙂 As for the old kitchen cabinets, I would probably re-use the two drawer cabinets. As long as they are in good shape or fixable. I would put the drawers on full ext slides, re paint and fill them up. Perhaps put in dividers depending what you intent too store in them? My compresor is much smaller, but im interested to know how you plan to make it quieter and not starve it for air. 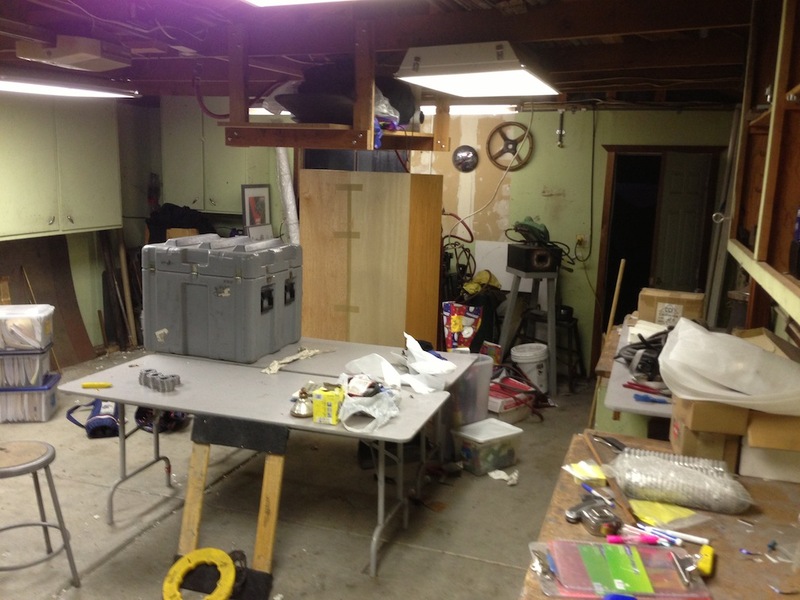 My woodworking is confined to a 10′ x 10′ space in my other, larger shop. So this will be a significant upgrade in size. 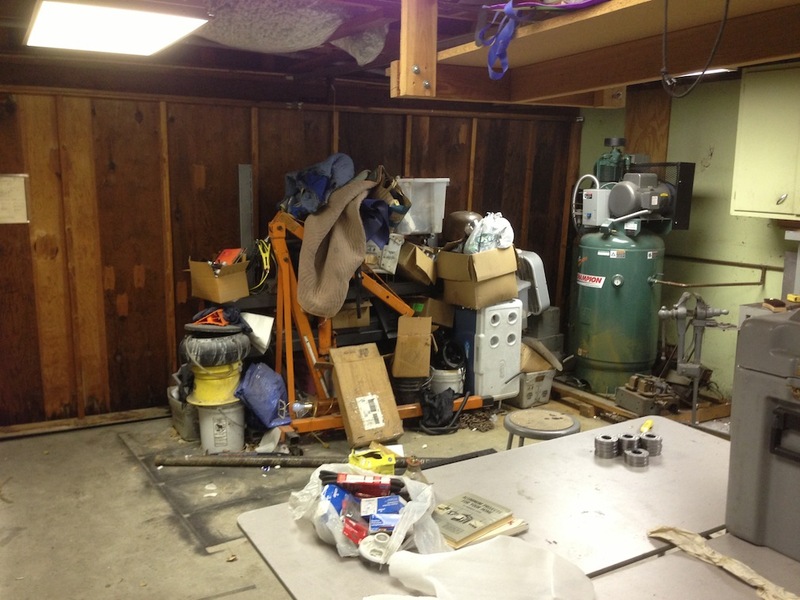 The previous homeowner used this as his woodworking shop, I can see where he had a vise mounted to one of the cabinet bases, and another place where he had a (power) miter saw. My plan for the moment is just to keep clearing out the space for now. I don’t want to move into it until it’s clean and properly set up. 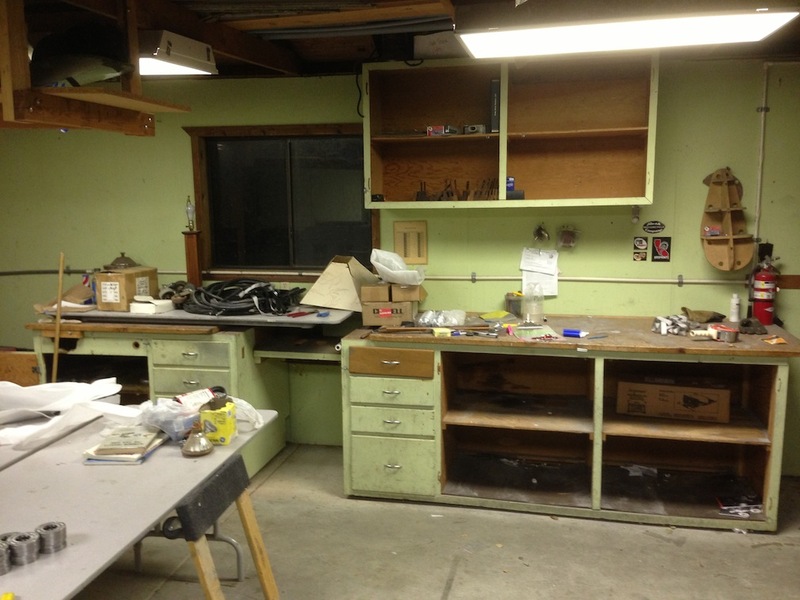 I’ll keep working in my other shop, sharing space with the metalworking equipment. Next weekend I’ll probably rip out some of the cabinet bases to free up floor space. I’ll keep at least one segment (I think) for my Millers-Falls miter saw. Wow! Talk about a big project. But I’m so jealous you have so much shop space. I’m excited for you. So I’m wondering, do you see your woodworking space as being mostly hand tools with maybe a couple of machines for milling?? Will you put your bench in the middle? I love mine NOT being against the wall. Just curious about what you’ve envision. It seems like you have a lot of room unless you go all machine .. maybe even for that. Yeah, I’m pretty lucky on the shop space front. But it’s been a focus in my life for a long time – since high school really. I’m still formulating my thinking on the wood shop. I know I want more natural light, and I have in mind making some divided light windows. I’d like to replace the tilt-up garage door with hinged, curved-top carriage-style doors. I’d like to have wood on the walls instead of painted drywall eventually too. My workbench (gotta get back to finishing that!) will be away from the wall, no question about that. As far as power tools, except for heavy dimensioning of stock I’m pretty happy with hand tools. But I also plan to re-do my kitchen and do a lot of built-ins/wood trim in the house, and I know I’m going to want power tools for that work. Table saw, jointer and planer. None of this is in the budget at the moment, so it’s something that is going to take a while to come to fruition. The first order of business is just to get it cleaned out as much as possible and put a non-green coat of paint on everything. Wow! Well, it’ll be very fun to watch. I have a kitchen remodel in my future (2 to 3 years), but I’m going to contract most of including the boxes for the cabinets. But I plan on making the doors and the drawers. That way we’ll have spots to put most things and home harmony while I plug away at the rest (flooring, paint, trim .. and, of course, the doors and the drawers). I don’t know if you were serious but I would be interested to know about that power hammer? If you really are interested in selling!